(AXcess News) New York – Illegal Immigration critics are complaining that Arizona’s former governor,now Secretary of Homeland Security,played politics when she announced a state of emergency during the Bush Administration in response to illegal aliens and then she vetoed a new bill that would aid law enforcement in curtailing rampant illegal immigration. Then Gov. Janet Napolitano vetoed a bill that would have made the presence of illegal immigrants in Arizona a felony offense. She claims she was responding to the wishes of local police chiefs and sheriffs who want immigration arrests to remain the responsibility of the federal government. The new bill would have expanded the state’s trespassing law to let local authorities arrest illegal immigrants anywhere in Arizona,one of the country’s busiest illegal entry point. The legislation passed through the state legislature but was summarily blocked by the Democrat governor. In a letter to lawmakers,Napolitano said she opposed automatically turning all immigrants who sneaked into the state into criminals and that the bill provided no funding for the new duties. But critics say she was being disingenuous with her statements. One police commander claims she failed to mention that entering the US illegally is already a crime,albeit a misdemeanor. In addition,reentry into the US once an alien is deported is already a felony in the US. Besides illegal aliens,the bill would have put more teeth into Arizona law to deal with human smugglers and de facto slave-traders. “It is unfortunate that the Legislature has once again ignored the officials who are most directly affected by illegal immigration and instead has passed yet another bill that will have no effect on the problem but that will impose an unfunded burden on law enforcement,” Napolitano wrote in a press release. However,when she declared a state of emergency in Arizona last year,following the lead of another Democrat governor — Bill Richardson of New Mexico — Gov. Napolitano spent millions on her deployment of National Guard troops on the Mexican border. Political analysts believe she declared the emergency in order to criticize the Bush Administration as did Gov. Richardson. Supporters tough border security said the new bill would have provided Arizona with an opportunity to start gaining control of its vast border problems by providing a second layer of enforcement to catch the tens of thousands of immigrants who slip past federal agents each year. Republican Sen. Barbara Leff of Paradise Valley,who proposed the bill,said the governor had painted herself as tough on illegal immigration by declaring a state of emergency at Arizona’s border,but had taken little action to back up her rhetoric,according to the Washington Examiner. “I don’t think the governor wants to do anything about this problem,” Leff said at the time. She said the bill would have been a means to detain illegal immigrants until federal agents can pick them up. The Democratic governor,accused by her Republican critics of being soft on immigration,has vetoed other immigration bills from the GOP-majority Legislature during her tenure,including a proposal to give police the power to enforce federal immigration laws. She’s also provided services for illegal aliens and is a proponent of drivers’ licenses for illegals. While immigrants provide the economy with cheap labor,Arizona spends tens of millions of dollars each year in health care and education costs for illegal workers and their families. An estimated 500,000 of the state’s population of about 6 million are illegal immigrants. While defenders of illegal immigrants tell the American people that these unlawful workers pay taxes,some immigration experts say illegal are usually paid off the books by their employers so there are no federal or state tax deductions. And because of tax laws passed to help low-paid workers,they aren’t taxed even is they declare their wages to the Internal Revenue Service. Up to 28 percent of the work force in the country is paid in cash,meaning as many as one in four don’t have federal and state payroll taxes withheld,which creates the kind of economic unpredictability that potential employers tend to avoid,according to economic experts. Then Gov. Janet Napolitano’s veto of the new bill is an about face considering her past speeches in which she told voters she would have two state police squads focus on alien smuggling cases. Both plans offer millions of dollars to communities to thwart illegal entries,and money for combating gang-related border crime. State police in Arizona already work near the border. An average of 27 state police officers are near the border at any given time,assisting federal authorities in looking for fugitives trying to leave the country and people attempting to bring ill-gotten cash and stolen vehicles into Mexico. Advocates for state and local action said the idea will not fix Arizona’s vast immigration problems,but would discourage some people from sneaking across the border. “If the federal government isn’t going to do the job and Arizona is footing billions of dollars a year for illegal aliens,it makes sense for the state to get involved,” said Ira Mehlman,spokesman for the Federation for American Immigration Reform,which favors limits on immigration. Meanwhile,opponents of tough border security are already harping on racial profiling saying it would increase if officers unfamiliar with immigration law were to try and enforce it. They also say it could make investigating crime harder in immigrant communities,because fewer aliens would cooperate with police for fear of being sent home. Whenever cornered during a debate over law enforcement,liberal-left activists will always bring up the “racial profiling” issue whether it’s germane to the discussion or not. It puts the proponents of law enforcement on the defensive since the debate then becomes one in which the debater must prove he or she is against racial profiling. 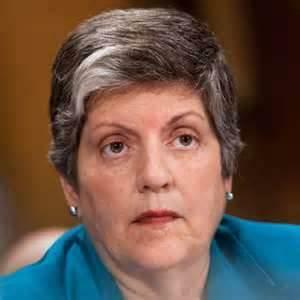 And what’s happened to the career of Janet Napolitano? She’s been appointed to head the federal agencies responsible for immigration enforcement.